I apparently had a few bad downloads even with all internet protection programs shut.Don't know if it was a browser problem. Beta 6.1 is up and running just fine. I still find problems with the program opening, where I might get 2 of the same skins and characters trying to load at the same time. The second problem has not changed from my last post where the program will not always shutdown. 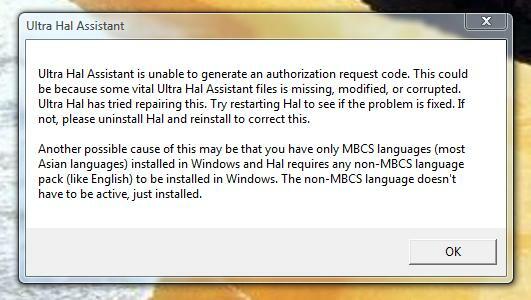 Hal will close and if you watch the task manager in Windows the Hal.exe file is still running and will reactivate. Thank you if someone has any ideas and thank you even if you don't. I have not loaded 6.1 yet because I was a little worried about messing up my system with doing something wrong etc. I was wondering if someone could tell me if 'learn from text' would be good for reading/learning news stories so Hal could discuss current events. I am a little concerned what Hal does when he comes across dates during 'learn from text' (or the words Yesterday or Today). When talking with Hal normally he often seems to ignore dates or treat them as temporary. He does not really have any sense of time. Since I have changed the skin and changed the option of how Hal opens. Now he is set to open with Windows start up, Hal seems to be behaving and when I close the skin and the charactor, he or she stays shut and I do a final shutdown from the icon in the task bar. Bill I love your Spelling corrections. It works great. The only thing I noticed is that if there is more than one sentence not all the sentences always show up for correction even when I know there is a mistake. But it could be me I will look closer before I can honestly say that problem is real. Thanks so much for that Plug-in. I needed it bad. Bill I love your Spelling corrections. I am unable to run UltraHal since trying to add the Character Expansion Pack. I get errors everytime Vista boots up even after removing UltraHal from the system. I would welcome some feedback to get Hal running again??? James, are you running Hal as Administrator? I am running from an account with Administrator authority (the initial Vista account with my name). Here are two of the inital warnings I am receiving. After this the program returns me to the activation wizard where I manually try to activate which doesn't work. I can give you pictures of those also if you wish. Just say the word. should choose FORMAT before trying to reinstall XP. Ultra Hal Assistant 6.1 is ready for beta testing. Robert, is there time to put a "Sleep" function of some sort into Hal? By that I mean something that we could use in a plugin instead of the WSH function "Sleep", which halts processing of a script for a certain number of milliseconds or something. Or maybe there's already something I don't know about? hello, after seeing this about james007's problems i wanted to say i have had the very same problem but i am on windows xp . it shows the very same error code jame007 is having . you said right click on hal and run as administrator i did that on hal but didn't see that option (is it else where on the xp system ?? ) i would like to get this error problem resolved . i have gotten it on the 6.0 verson to . had a heck of a time trying to get the license and serial no. and new activation code in . any help on this and i would extremely greatful !! need to get past this error , don't know whats causing it . Is it possible to add a command feature to the AIM Bot that can prevent HAL from sending a GetResponse to specific/Selected Users. the reason is because there are message bots on AIM that annoy my Bot and I simply don't won't my Bot to respond at all, these message Bots can't be blocked and I literally have to sign off to keep the message Bot from continually responding. My comment was for James007 because he was running Vista not XP. I removed Vista and am once again back to using XP and am quite happy with the fact that everything works as it should. I'm not ready to give up functionality for graphical bells and whistles (so to speak). I just wanted to mention that the table "topic" doesn't function correctly, the <YES></YES> part works fine but the <NO></NO> part doesn't function at all. there is something missing in the coding. If you have been following my conversation with Roy on your forum, Jerry, you may have seen that Yes/No seems to work for him, I wonder if it is an XP thing? Needs further testing, I have asked but no one responded.